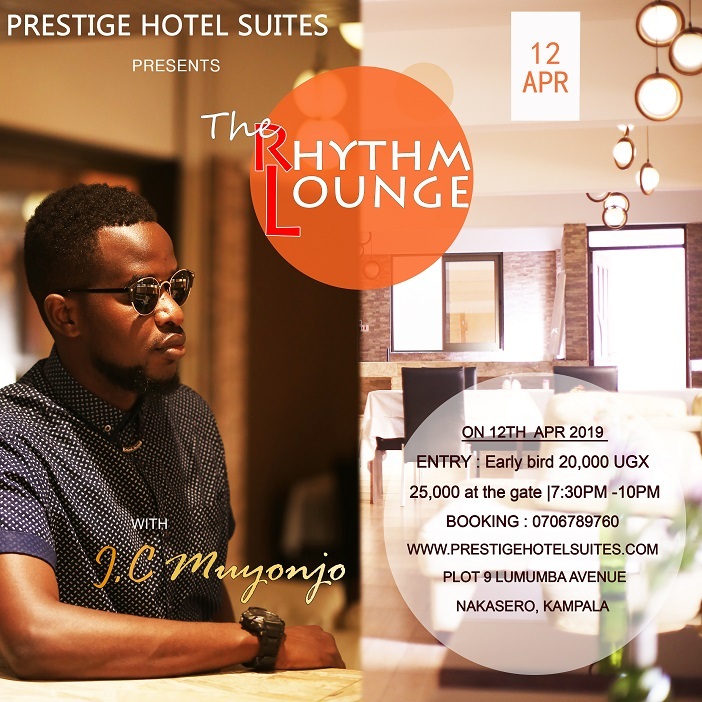 We are excited to present to you the first of our series of The Rhythm Lounge events – curated by none other than J.C Muyonjo. Bored of your usual Friday night? Then, come check out The Rhythm Lounge With J.C Muyonjo. Buy your ticket Now and Save. Pay via Mobile money: 0706789760 or pay at our hotel, Prestige Hotel Suites, before 12 April! J.C is a Ugandan singer, songwriter and guitarist who marries his music with three main dialects; English, Lutooro and Luganda. A touch of RnB, neo-soul, blues, jazz and afro beat is what his music is made of. He has worked with several renowned musicians in Uganda such as Maurice Kirya, Ruyonga, ThaMith, Sandra Nankoma and many more. Having performed at festivals such as the Bayimba International Festival, Blankets & Wine, Doa Doa, Jameson Connect, Bailey’s Picnic, Aka Dope, Viva Con Agua, this is an event you don’t want to miss. Fast food platters will be available for purchase during the event. Wines, whiskeys, beers, soft drinks, will all be available for purchase during the course of the event. Payment can be made via mobile money to 0706789760 (please quote the rhythm lounge) or you can pay at our hotel Prestige Hotel Suites before the event. At the entrance, tickets will be 25,000/-. Please note we have very limited seating and you will only be able to purchase tickets at the entrance subject to availability.